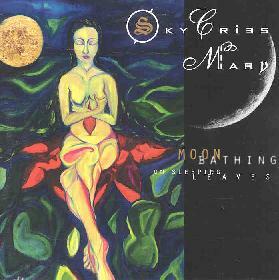 Sky Cries Mary - "Moonbathing on Sleeping Leaves"
Seattle's Sky Cries Mary continues to amaze with their innovative brand of avant garde music on Moonbathing, their third major label release. Like its predecessors, this one is another 70-plus minutes of stylish, and at times spirited, progressive rock. The seven-member group has the versatility and depth to tackle most any musical style, and they often do. All sorts of unusual ethnic and percussion instruments (including the kitchen sink) are employed, which help to generate that bohemian flavor they've gotten us accustomed to. While this album doesn't quite live up to the standard they set with A Return to the Inner Experience and This Timeless Turning, some of the high points easily reach (and perhaps surpass) that level. The husband-wife team of Roderick and Anisa Romero share the lead vocal duties, most often in a high-low duet style that I think they're beginning to overuse now. Anisa's voice is strong and pleasing, although she occasionally will degenerate into that over-emotionalized mode that plague so many pop icons; those intentional voice-crackings can get to me. But this is the exception rather than the rule. The musicianship is topnotch, adept during both the quiet, sensitive passages and when going full bore. Todd Robbins (aka DJ Fallout) and Gordon Raphael man the sequencers and keyboards that provide the embellishments for the core of Michael Cozzi, Juano Davison, and Ben Ireland on guitar, bass, and drums, respectively. A whopping 14 tracks appear on Moonbathing, the standout being 'An Ant, the Stars, an Owl, and its Prey,' a sensuous astral journey that is right on target when Anisa sings 'I see you floating by, staring at the stars.' The title track is based upon an indulgent hook offered up by a so-called swirling fuzzy-flange bass and Anisa's space whispering, and is the basis for a separate (limited edition) mini-album's worth of techno remixes. Another highlight is reached mid-stream with the segued tracks 'Ringing', the instrumental link 'Smoke Break', and 'Want.' The former vocal track builds up slowly, letting loose during the choruses. The album finishes up with the techno-ish 'Nowhere' and the low-key 'Insectoria,' with subdued vocal mumblings eventually leading skyward with a lilting melodic jam that creates closure. We can be pretty sure that we won't be seeing Sky Cries Mary 'selling out' any time soon. How they managed to arrange a deal with a label like Warner Bros. is beyond me. They're far too creative and musical to be associated with the contrived, mass-marketing juggernaut that is the American music industry. But if their relationship with Warner helps to put thoughtful music in the hands of unsuspecting and impressionable teenagers, I'm all for it.